Through the years Danforth Bay, The Bluffs RV Resort, King Pine Ski Area and parent company, Purity Spring Resort, have actively pursued various ways to minimize their impact on the environment. 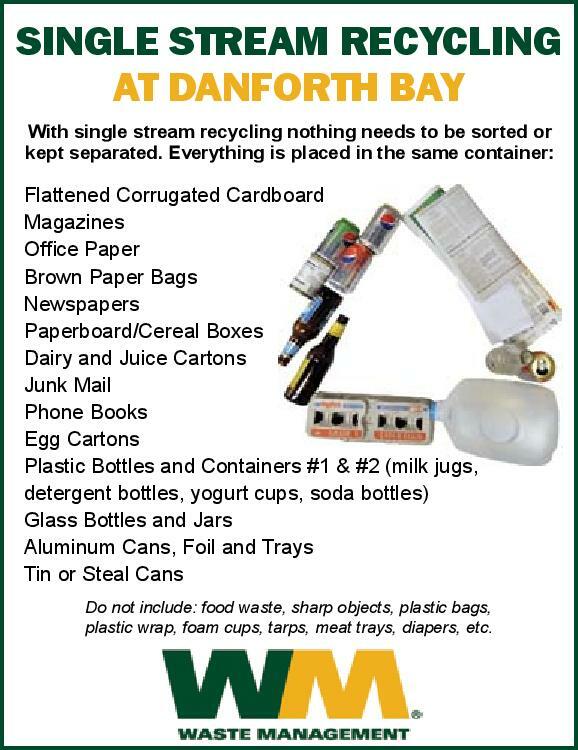 While a commitment to "preserving the environment" continues to be a top priority, recycling has always been a challenge at Danforth Bay. In 2010, the resort released a new program that simplifies the entire process for everyone. Recyclables may be placed in recycling containers located next to the propane fill station. Glass, tin, aluminum, plastics (#1 - #6), and paper -- including newsprint, magazines, catalogs, etc. -- may all be recycled together. Please breakdown all cardboard boxes before placing in recycling containers and place only BAGGED household trash in the dumpsters.